KINGSTON, N.Y. – On Monday, February 11th, Adele B. Reiter – Deputy County Executive and Chief of Staff under the former administration of Ulster County Executive Michael P. Hein – was sworn in as Acting County Executive, having been designated by Hein prior to beginning his appointment, effective today, as Acting Commissioner of the NYS Office of Temporary and Disability Assistance. “I have a deep respect for public office and the inherent responsibilities that come with it,” Acting County Executive Reiter continued. “Ulster County Government derives its power from the people, having adopted a new Charter form of government just over a decade ago. I call on the Legislature to now join me and do the work of the people so that we may build on the successes of the past that the Charter has allowed while turning an eye towards the future and collectively help Ulster County continue on the path of responsible fiscal management and social justice for each and every individual. “As Acting County Executive, I will continue to strive to make the community better for our families, our friends, our neighbors and all those who choose to live here. That includes working to help prevent people from being taxed out of their homes while continuing to support our existing businesses, attracting new employers to the area, and providing the exceptional level of services that our residents – especially those amongst us most in need – expect and deserve. On Monday morning at 9:15 A.M., in front of a gathering of department heads and deputies from across County government, Ulster County Clerk Nina Postupack administered the oath of office to Acting County Executive Reiter in a ceremony held at the Ulster County Office Building in Kingston. On Sunday evening, prior to the official swearing-in ceremony, Ms. Reiter was joined by friends and family, including County Executive Mike Hein, for a private reception. Adele B. Reiter, Esq. has a Bachelor of Arts from the State University of New York at Stony Brook, a Juris Doctorate from Temple University School of Law, and is admitted to practice law in New York State. She began her career as an Assistant District Attorney in Bronx County, New York. Since moving to Ulster County, New York in 1982, Adele has practiced law in the health care field, in private practice and as Deputy Corporation Counsel for the City of Kingston. Prior to the formation of the Office of the County Executive she served as Deputy Ulster County Treasurer. Upon his election as Ulster County's first County Executive, Michael P. Hein’s first appointment was to install Adele as Deputy County Executive - a position that she held along with the title of Chief of Staff and the designation as first in the line of succession for the duration of the Hein administration. Adele has volunteered her time with the Ulster County Council of Girl Scouts, the Mental Health Association of Ulster County, YWCA, Kingston Hospital Foundation, the Women’s Health and Fitness Expo and other local organizations. She currently resides in Hurley with her husband of 42 years, Paul and enjoys frequent visits with her two daughters, their husbands, and her four grandchildren, all of whom reside in Ulster County. 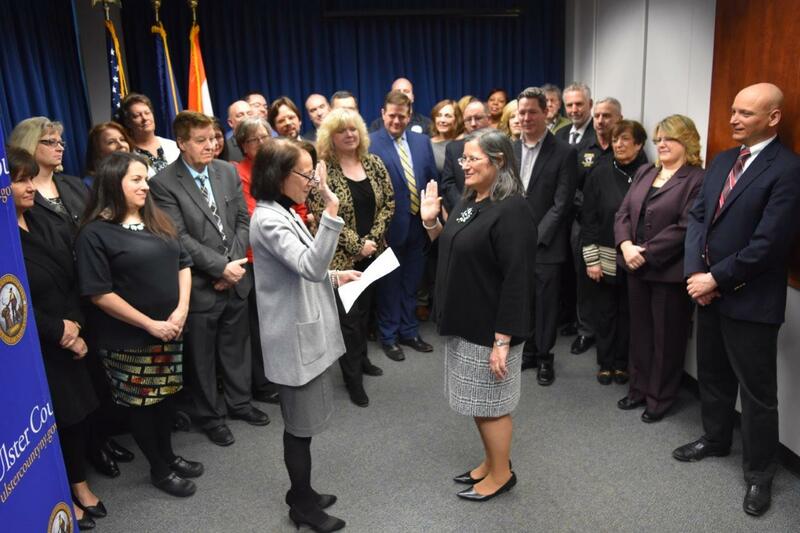 Pictured above: Acting County Executive Adele B. Reiter takes the oath of office, which was administered on Monday morning by Ulster County Clerk Nina Postupack before an audience of Ulster County department heads, commissioners and deputies. Pictured below: 1) Acting County Executive Adele B. Reiter with former County Executive Mike Hein and members of her family at a private reception Sunday evening prior to the swearing in ceremony on Monday morning; 2) Acting County Executive Adele B. Reiter with former County Executive Mike Hein and close friends at the private reception Sunday evening prior to the swearing in ceremony on Monday morning; and 3) Acting County Executive Adele B. Reiter with friends and family at the private reception Sunday evening prior to the swearing in ceremony on Monday morning.